There are some great points here. It seems that too often, people analyze studies as though the variations across individuals were nothing more than random chance, yet there are of course concrete (maybe just not known) explanations. Many give weight loss advice based on shallow «tricks» to simply reduce calorie intake (or increase expenditure–«take the stairs»). However, the individual variation in overfeeding, exercise, underfeeding, etc *implies* more complexity and a need to have a deeper understanding. Unfortunately that goes largely unrecognized. There are weaknesses inherent to all studies and I think stats are the biggest!! What are your thoughts on scientists who subdivide subjects in the analysis by responders v. non-responders? Insulin secretion and IR are the signs and symptoms that can divide those who lose the most weight with low GI diet versus low fat (high GI). Have you seen this gem? Ebbeling, Ludwig et al JAMA 2007, which was cited in the (my favorite) Carnivore Connection Revisited article. Dr. B G, I agree stats is an inherent weakness in biological studies. I think that usually there is nothing to gain by dividing subjects into responders and non-responders. As you say, there are just some many influencing factors (confounders). Most likely many of these confounders will change with diet, lifestyle, toxins, stress and of course hormonal milieu and so those who are non-responders may not be non responders all the time. Our biology is not static. Insulin resistance is far more complex than carbs and insulin (or paleo vs western diet). And it is important to remember that IR is also a protective mechanism and that there are many ways to measure IR and that the most common method only measures hepatic IR. I loved the carnivore connection hypothesis article (think I might have written about it on the blog once), but I don't think I've read the Ebbing et al. There's some interesting stuff there. Going to have to read it more thoroughly though. My guess is that our ability to respond to exercise and diet are very much dependent on which genes we have, and which are switched on or off. The latter is of course partly dependent on our behavior and our diet (and environment). The (far?) future is indivudually tailored diets and exercise programs to let us maximize quality of life and health, within the framework of our genes. Thanks Pål! I concur with the thoughts on this post and particularly your statement 'IR is also a protective mechanism' because without it we lose energy too readily and do not store fat efficiently in the appropriate depots…for the brain, fertilty, body composition, etc. All of our hormones actually affect IR too. Have you heard of Björntorp? He's done a lot of cool stuff with insulin and hormone body fat 'mapping' research. Here — he restores normal insulin sensitivity to oophorectimized rats with E2 and P (estradiol, progesterone). P alone does not work; requires E2 in the symphony of repairing hormone havoc. Fasting doesn't work for a lot of girls (like me and HIIT mama, Meredith who commented). I tried to post here with Stefani but got spammed out apparently. For females, the animal studies and human anecdotes (like me) appear to show that cortisol gets knocked out the ceiling with intermittent fasting or starvation. I would put ketosis diets into here as well for adversely raising cortisol and IR, and thus prevently body fat loss. The gender differences also are not highlighted in many studies which is a shame because hormonally we are VASTLY different. Females may also hoard environmental toxins differently than men since our body fat % is ~DOUBLE. One more thing… as you know I loved your published study. It creates more questions than answers! Besides including blood and salivary hormone testing in your NEXT study, I would not mind seeing a breakdown of DEXA fat loss among fat metabolizers v. non-fat metabolizers. The metabolic flux, substrates, fat burning responses to exercise and EPOC are fascinating. This study divided the responders by RQ, respiratory quotient (low=higher fat burning which corresponded better with negative energy balance with mod intensity extended exercise). I agree we have to be careful of assuming results relating to IR in men also apply in women. The example with fasting is a good one. Hormones matter. Interesting Bjørntorp article. I know him from other research, but had not seen that particular article. 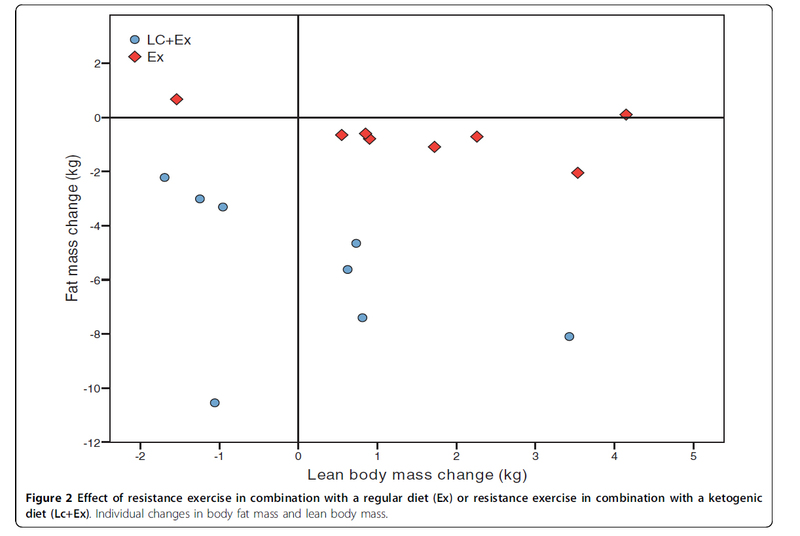 (b) 'association between fat mass and DEI [daily energy intake] in the full model in Table 3. 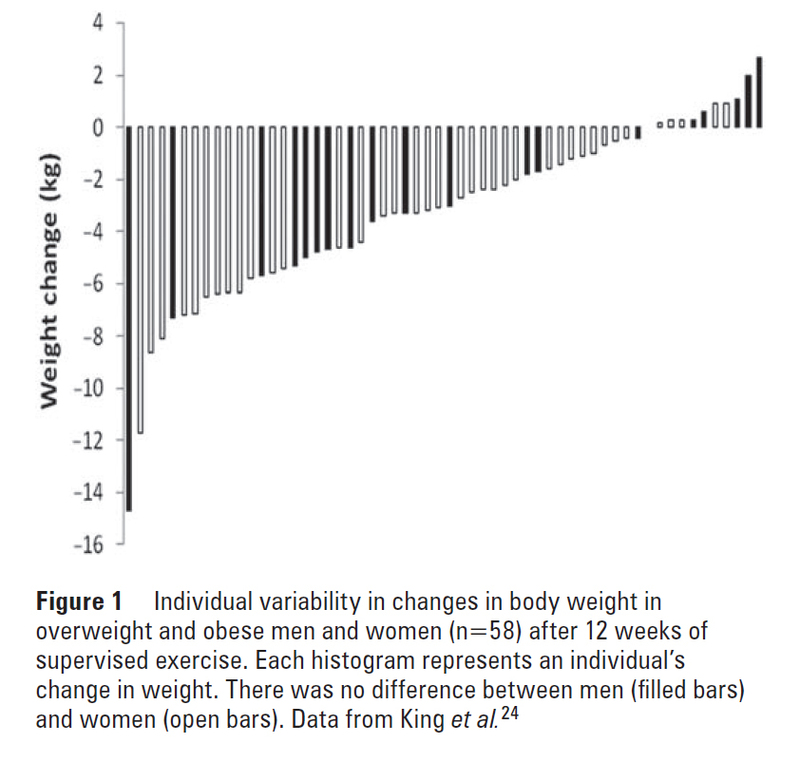 The explanation for this is not clear, but perhaps fat mass, after other metabolic variables are accounted for (fat-free mass in particular), acts as a brake on increased food intake.' I think sarcopenia should be a disease state since it may be able to predict many things including mortality, insulin resistance, hormone status, RQ and particularly LEAN BODY MASS… We have leptin for long term fat mass signalling, but what is the signal for long term lean body mass…??? AMPK? PPAR activation? Glut 4? hormones? Insulin resistance (liver v. muscle v. adipose (BAT v. WAT v. VAT)??? Forrige Forrige innlegg: Kan man stole på sin egen kropp?